It's Friday and let's have some fun (I'm listening to Lady Gaga to prepare for the weekend)! This gift list I put together includes a number of fun items for that fun friend on your list. 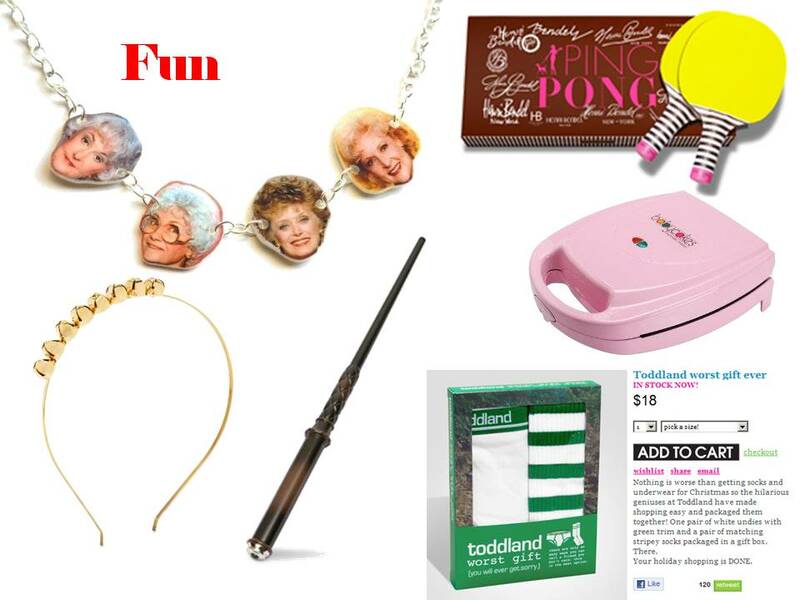 • Um, if the “Thank You For Being a Friend” Golden Girls Necklace doesn’t scream fun, I’m not sure what does. Oh yeah, maybe the Betty White Calendar? Either of these gifts are perfect for my friend Melly who has every season of the Golden Girls on DVD! • Bowling has kinda rolled off the radar in celebrity gaming and now Ping Pong is all the rage. Henri Bendel sells this super cute and luxe set, but I am sure you can find some gear at almost any local sporting goods store. • No, this is not a pink Foreman Grill. Behold! The Cupcake Maker. As the princess of all thing cupcakes, you would think I would be super jazzed over this little gem, but I think I need to try it to be convinced. And besides, who wants another gadget for the kitchen!? Regardless, the fun level is high here. • You would think that I’d be all about bells on clothes during the holidays due to my love of all things cheesey, sparkly, rufflely and cute, BUT I draw the line at apparel that makes noises. Once exception: the Kate Spade Jingle Bell Headbad. So fun, clever and cute! • Know someone into Harry Potter? Then the Wand Remote Control is the perfect gift. I wonder what spell fixes your Comcast cable when it goes out! • Legend has it that the hubs once threw a hissy fit after receiving underwear and socks for Christmas. In his mind, these are a necessity – not a gift. From Fred Flare I give you – The Worst Gift Ever. A package that includes both underwear and socks…perfect for Brady! !